See it all in 4 days with this New York City Shop, Hop and Top Experience including Woodbury Common and Observatory. 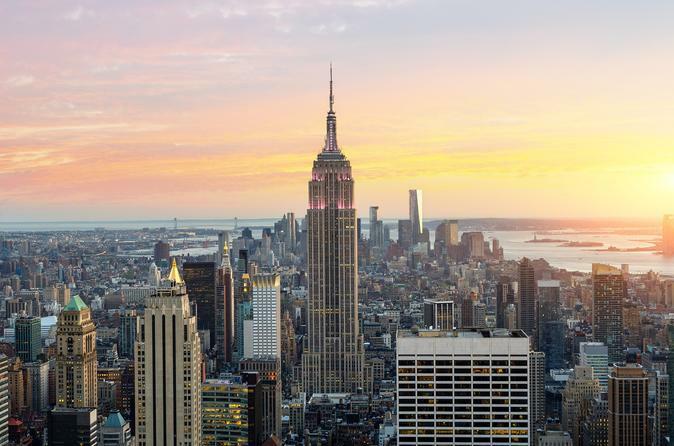 An ultimate package that includes 4 days of hop-on hop-off sightseeing bus tours, a full day shopping trip to Woodbury Commons Premium Outlets, and your choice of tickets to either the Top of the Rock or Empire State Building, two of New York’s most iconic skyscrapers! Your 96-hour hop-on hop-off bus pass grants you unlimited access to 3 fully-narrated tour loops through Downtown, Uptown and Brooklyn. Hop on and off as many times as you please to see all of the attractions along the way. Be sure not to miss out on some skyscraper sightseeing, a must-do for any first time visitor to New York City! Whether you select the Empire State Building or the Top of the Rock Observatory, you will be treated to stunning 360-degree views among the clouds. Your choice of tickets to one of these world-famous attractions is included with your Shop, Hop, and Top tour package! Just one hour north of Manhattan sits the Woodbury Commons Premium Outlets, home to some of the best outlet shopping in New York! With deals from top designers such as Burberry, Dolce & Gabbana, Ralph Lauren, Prada, Saks Fifth Avenue Off Fifth, and more, you can spoil yourself at an unbeatable price! Woodbury Commons is also packed with children’s stores such as Disney and Carter’s, as well as specialty shops for jewelry, housewares, chocolates, and other novelty gifts. With so many options in one convenient location, you’ll find something for everyone on your list at Woodbury Commons. As part of your pass, you also receive the fully-narrated Night Tour, offering unparalleled double-decker views of the bright lights of NYC! Also included with your pass are the free Hop-on Hop-Off Ferry Tour, entrance to the Museum of the City of New York or New York Historical Society, AND an Eat and Play Discount Card valid for discounts at 100 restaurants for 30 days for up to 4 people!